The nation’s library will honor poet Allison Hedge Coke at a special Oklahoma City reading in the 46th Star Auditorium at the Ronald J. Norick Downtown Library on April 28 at 6:30 p.m. A reception and book signing will follow in the Friends meeting room. Hedge Coke is the 2016 Witter Bynner Fellowship winner. Download the full press release for this event. Photos for the press release are available by clicking on them. The event flyer is available for you to download and help promote the event. You can also share the Facebook event page. 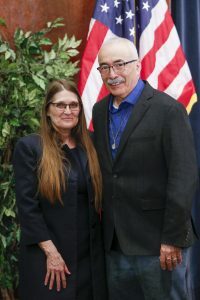 Hedge Coke’s honors include an American Book Award, an Independent Publisher Book Award, King-Chavez-Parks Award, Pen Southwest Award, Wordcrafter of the Year Award, and a Lifetime Achievement Award from Native Writers’ Circle of the Americas. Her books include Streaming (2015), Blood Run (2007), Off-Season City Pipe (2005), Dog Road Woman (1997), and Year of the Rat (1996). 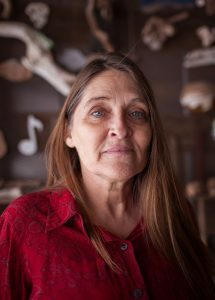 Her 2014 memoir, Rock, Ghost, Willow, Deer (2014) is a searching account of her coming of age, as the daughter of a mother suffering schizophrenia, yet storied and deeply immersed in her mixed heritage, including Metis, Huron, Cherokee, Luso, French-Canadian, Irish, Lorraine, Scot, and English. Hedge Coke is also the editor of nine anthologies, including Sing: Poetry From the Indigenous Americas, named a Best Book of 2011 by the National Books Critics Circle’s Critical Mass. Witter Bynner Fellow Allison Hedge Coke and Poet Laureate Juan Felipe Herrera at the Witter Bynner Fellowship presentation, March 9, 2016. Photo by Shawn Miller. View the Library of Congress interview, “This is the Conversation”: Getting to Know Allison Hedge Coke. Streaming by Hedge Coke was released in 2014, see the Coffee House press kit for its announcement. Sponsors of the Oklahoma City readings include Red Earth MFA @ Oklahoma City University, Friends of the Oklahoma Center for the Book, the Oklahoma Center for the Book in the Oklahoma Department of Libraries, the Metropolitan Library System, and Best of Books. The Ronald J Norick Downtown Library is located at 300 Park Ave in Oklahoma City. Today is the day for the Oklahoma Book Awards!!! Did you know that you can access thousands of state government publications and documents online?